On January 17th, Mr. Guillaume de Vaulx led a session of our internal seminar on the topic of “The Islamic Problem of Politics: Reintegrating dīn at dunyā”. From a Hegelian perspective, Guillaume reflects on the Islamic “moment” of human thought, which would correspond with the reintegration of religion into the affairs of the city, after they had been discarded in the name of the Christian principle which wants to “give back to Caesar what is Caesar’s”. On January 30th, Mr. Aziz Hilal gave the third session of his introductory seminar on Arab philosophy. Click here to see the details of the next dates…. From January 23‒25th, the IDEO organized in Lyon an introductory workshop on Islam for the Dominican student brothers from the Province of France. Those who presented are: Mr. Éric Geoffroy, Mr. Abd al-Haqq Guiderdoni, as well as Rémi Chéno, OP, Jean Druel, OP, and Emmanuel Pisani, OP. On January 10th, Mr. Guillaume de Vaulx gave a lecture on the topic of “In the Beginning was the Number: The Arithmetical Basis of Philosophy at the Dawn of the Ninth Century”, during the conference “Mathematics and Philosophy in Classical Islam” in Beirut. On January 17th, Mr. Dominique Avon gave a lecture in Brest entitled “Religious Dimensions of Conflicts in the Near and Middle East”. Dennis Halft, OP was granted the 2019 Alexander Böhlig Award for his doctoral dissertation “The Arabic Vulgate in Safavid Persia: Arabic Printing of the Gospels, Catholic Missionaries, and the Rise of Shīʿī Anti-Christian Polemics” (Freie Universität in Berlin, 2016) by the Gertrud-und-Alexander-Böhlig-Stiftung. The award ceremony will be held at the Berlin-Brandenburg Academy of Sciences and Humanities in Berlin on December 13, 2019. On January 3rd, we received for lunch Mr. Glenn Miles, the new ambassador of Australia in Egypt. On January 14th, we received for lunch Mrs. Mari Neuvonen, First Counsellor of the Finnish Embassy in Egypt. In January, we had the pleasure of receiving at the Scholars’ House Mr. Yousef Elzalabany, student at Princeton University in the Department of Near Eastern Studies, Mrs. Catherine Mayeur-Jaouen, member of the IDEO and Professor of the History of Modern and Contemporary Islam at the University of Paris-Sorbonne, Ms. Hadel Jarada, a researcher in Islamic intellectual history, Mr. Lutz Rogler, researcher in political Islam, Ms. Nadirah Mansour, PhD student at Princeton University, and Mr. Alain Messaoudi, Professor at the University of Nantes. From December 13‒20th, in Iraq, Amir Jajé organized the second part of the conference devoted to relations between Twelver Shiites and Christians (Paris, April 2018). This second part of the conference consisted of a workshop on Arabic manuscripts in Najaf and a one-day study session with the al-Khoei Institute. 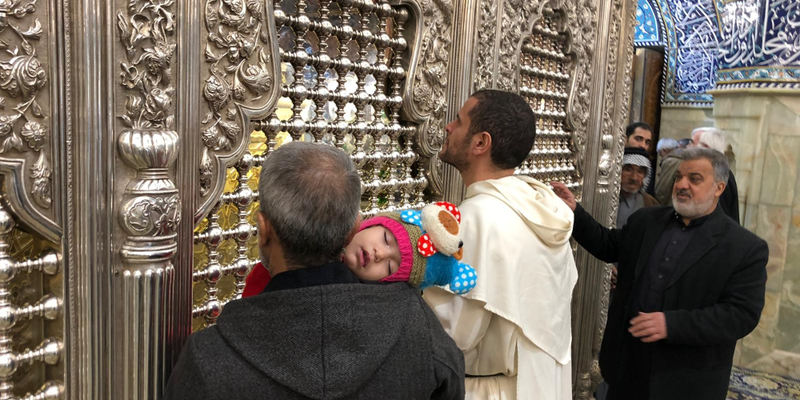 This trip was also an opportunity to visit Christian villages in the North, Qaraqosh in particular, as well as Erbil and Mosul, and Shiites shrines in the South (photo). At a time when Shiites and Sunni seem to be in a political, cultural, and confessional impasse, the IDEO has the opportunity to work with both, serving the Arab-Muslim heritage as a whole. It will take years to overcome the inter-community violence, from which the Yezidi and Christians have also suffered a lot. May the Child of the manger bring peace and gentleness into hearts and the world. We wish you a year 2019 of peace, justice, and truth in love. On December 23rd, M. Frédéric Lagrange , Professor of Arabic Language and Literature at the Sorbonne University, led a day-long seminar on translation with French-speaking PhD students from the University of al-Azhar, as part of our project Adawāt. From December 4‒7th, Guillaume de Vaulx participated in the international conference entitled “Methodical Exploration of Arabic Manuscripts of Philosophy in the World”, which was held at the Maison des sciences de l’homme in Paris. His lecture was entitled “Once Again, the Real World is Rational: Systematic Exploration of the Manuscripts of Rasāʾil Iḫwān al-Ṣafā All Over the World”. On December 19th, Jean Druel, OP participated in a conference entitled “Arabic, as seen by Westerners”, organized by the Manuscript Center of the Library of Alexandria. His lecture was entitled “The Kitāb of Sībawayh: In the Hands of Orientalists and Arabs”. On December 11th, we received the visit of a group of Indonesian researchers and teachers from the University of al-Azhar and Wahid Hasyim University in Indonesia, as part of a study on “The relationship of Christians to the Koran and its influence in their tolerance towards Muslims”. Professor Muḥammad Sayf al-Dīn, who leads the team, is working on a project on cross-readings of sacred texts. From December 13‒20th, Amir Jajé, OP, Emmanuel Pisani, OP, Dennis Halft, OP, René-Vincent du Grandlaunay, OP, Mateus Da Silva, OP, Stéphane-Dominique Hindo, OP and Mr. Francis Richard participated in a workshop on manuscripts in Najaf, as a follow-up to the April conference organized by ISTR and IDEO in partnership with the El-Khoei Institute. Emmanuel Pisani, OP presented a summary report of the conference on the interactions between Twelver Shiites and Christians; René-Vincent du Grandlaunay, OP presented the cataloguing work of the IDEO Library. In November-December, Emilio Platti, OP taught the class “Introduction to Islam” at the Catholic University of Leuven (KU Leuven). Emmanuel Pisani, OP was interviewed, along with Pierre-Henry Salfati and Bruno Abd-al-Haqq Guiderdoni, by Abderrahim Hafidi on the TV program “Les chemins de la foi” on channel France 2, on December 16th on the topic of Adam and Eve, and again on December 23rd on the topic of Jesus and Mary. On December 23rd, Emmanuel Pisani, OP was interviewed by Ghaleb Bencheikhon the TV program “Questions d’islam” on the French culture channel. On December 8th, we welcomed for lunch Mr. Ruy Amaral, Ambassador of Brazil to Egypt. On December 10th, we welcomed for lunch Mrs. Julia Skorupska, Political Counsellor of the Embassy of the United Kingdom, and Mr. Paul Kett, Second Secretary. On December 11th, we received for lunch Mr. Francisco Carrión Molina, correspondent of the newspaper El Mundo in Egypt. In December, we had the pleasure of receiving at the Scholars’ House Mrs. Rachida Chih, researcher at the Scientific Research National Center (CNRS), Mr. Ahmed Khalid, PhD student in the Department of Islamology at the University of Bayreuth in Germany. Christian representatives: P. Vincent Feroldi, Director of the SNRM, Sister Colette Hamza, his assistant, Emilio Platti, OP, Claudio Monge, OP and Adrien Candiard, OP. Muslim representatives: Djamel Djazouli, Denis Gril and Omero Marongiu-Perria. The intellectual and academic tradition of Muslim theology often struggles to make its voice heard and is often neglected by proselytizing discourse. The work of this group is therefore extremely encouraging! From November 5-8th, Amir Jajé, OP participated in an international conference entitled “Muslim-Christian Dialogue for Better Understanding”, organized by the Royal Jordanian Institute for Interreligious Studies and the Forum for Development, Culturem, and Dialogue (FDCD) in Amman. From November 7-8th, Adrien Candiard, OP gave two lectures on Islam, one at the parish of Saint-François-de-Molitor in Paris, and the second at the Dominican Priory in Rennes. On November 9th, Emmanuel Pisani, OP, along with Mohamed Khenissi, gave a lecture entitled “The Question of Apostasy in the Muslim Legal Tradition” during a study day organized by ISTR in Paris. On November 11th, Jean Druel, OP gave a lecture at the French Institute as part of the “Midan Mounira” lecture series entitled “The Arabic Language: This Beautiful Unknown” in which he presented the state of research on the origin of the Arabic alphabet, and the historical sources for the study of written and oral variations of Arabic. On November 16th, Mateus Domingues da Silva, OP participated in the conference entitled “Rationality and Mystical Tradition: Shiite and Catholic Perspectives”, organized at the Pontifical University of Saint Thomas (Angelicum) in Rome. He gave a lecture entitled “The Human Knowledge of God According to the Metaphysics of Light of Suhrawardī”. On November 17th, Jean Jacques Pérennès, OP participated in a conference/debate with Jacques Huntzinger in Paris on the topic of “Religiosity and Secularization: Contradictory Trends”, organized by the iRemmo (Institute for Research and Studies on the Mediterranean and the Middle East). On November 17th, Emmanuel Pisani, OP, along with Ghaleb Bencheikh, gave a lecture entitled “Prayer in Religious Traditions: A Challenge for Interreligious Dialogue”, at the Interreligious Forum organized during the Weeks for Islamic-Christian Encounter in Strasbourg. On November 21st, Claudio Monge, OP gave an opening lecture at the Dies Academicus 2018‒2019 of the theological faculties of Veneto and on November 22nd, he gave a lecture in dialogue with Cristoph Theobald, SJ in Padua. On November 22nd, Emmanuel Pisani, OP led a conference/debate on the subject “The Questions that Muslims Ask Us”, at Saint-Jean-Baptiste parish in Rouen. On November 22nd, Emmanuel Pisani, led a conference/debate entitled “Why dialogue?” at the Lycée of Sacré-Cœur in Rouen. On November 26th, Emmanuel Pisani, OP led a conference/debate entitled “Rational Islam or the Islam of the Enlightenment, Yesterday and Today: Is There a Renewal of Muʿtazilism?”, at the Fabrique du 222. On November 23rd, Dominique Avon participated in a round table in Paris on human rights during a study day entitled “History and posterity of the Universal Declaration of Human Rights”. On November 24th, Emmanuel Pisani, OP, Rabbi Gabriel Haggaï, and researcher Karim Ifrak led a round-table discussion on the topic of “Religions and Citizenship”, as part of an evening organized by Méo High School in Villeneuve-Saint-Georges. From November 25th to 28th, Claudio Monge, OP participated in a workshop entitled “Religion and Peace Education”, led by the Berghof Foundation, with sixteen religious leaders from sixteen different countries, in Bad Saarow (Germany). On November 8th, Jean Druel, OP was given a 5-year appointment as an expert by AVEPRO, the Vatican agency responsible for the evaluation of Catholic universities. On November 5th, we welcomed for lunch Mr. François Legué, First Counsellor of the French Embassy in Cairo. On November 5th, we welcomed for dinner Mrs. Alimatul Qibtiyah Badjuri and Mrs. Lailatis Syarifah, from Sunan Kalijaga Islamic University (Yogyakarta, Indonesia), who came to Egypt to counduct field research on women wearing the niqāb. On November 6th, we welcomed for lunch Mr. Wierish Ramsoekh, First Counsellor of the Dutch Embassy in Cairo, and Mr. Tsjebbe Paulussen, Political Counsellor. On November 9th, we welcomed for lunch M. Jakub Sypiańsky, PhD student at Johannes-Gutenberg University in Mainz, Germany, who works on the social context of intellectual exchanges between Byzantine and Muslim countries (750‒969). On November 15th, we received for lunch Mrs. Camilla Rasmussen, First Counsellor of the Danish Embassy in Cairo, and Mrs. Louise Haubro, Political Counsellor. On November 19th, we welcomed for lunch Mrs. Melanie Franzen, Political Counsellor at the German Embassy in Cairo. On November 27th, we received for lunch Mr. Ibrahim Mansour, PhD student at the University of California, Santa Barbara and ARCE fellow in Cairo, who works on the origins of the Shadhiliyya Sufi brotherhood. This month I would like to go into some technical detail about our library’s catalogue, because things are evolving very quickly. Since 2001, René-Vincent du Grandlaunay, OP has developed, along with several developers, a cataloguing software system called AlKindi which is wholly designed for the classical Arab heritage. Since 2011, version 4 of this software has been completely redesigned to consider the IFLA LRM bibliographic model, which focuses on works, their cultural context, and editorial history. For a long time, we had been looking to share this exceptional tool with other libraries. This is now possible due to funding granted by the European Union (project Adawāt). 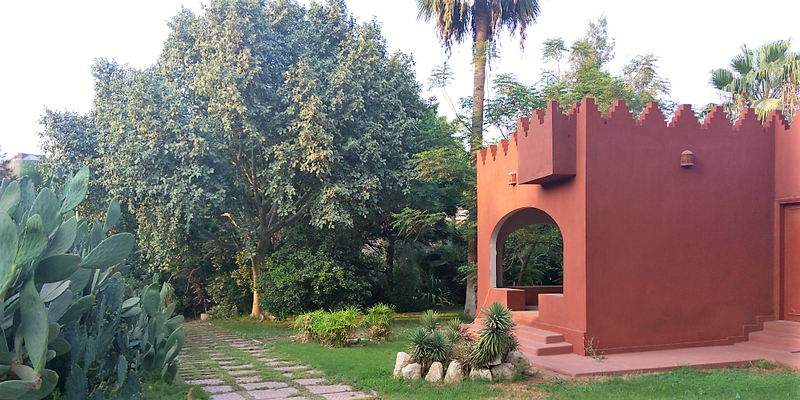 Since September, the Institute for Arab Manuscripts (IAM, Cairo, see the picture) has been cataloguing its manuscripts in the same database as our own. 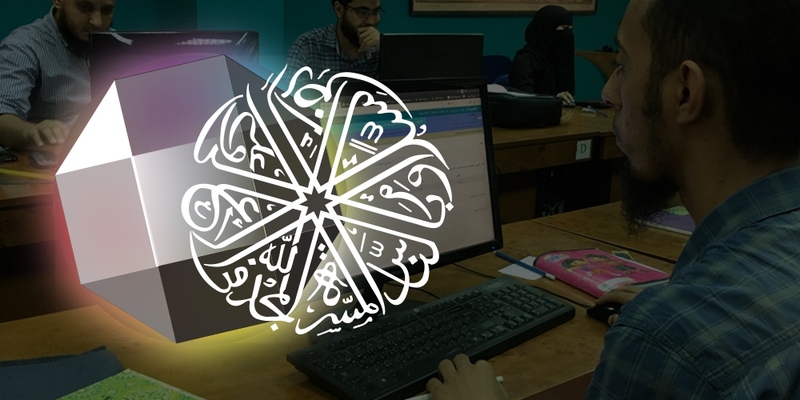 So, we are now taking our software and making a distinction between the integrated library management system (ILS), which we now call Diamond-ILS, and the portal dedicated to the classical Arabic heritage, which keeps the name AlKindi. All this data is available online: the AlKindi general portal (IDEO and IAM), IDEO’s catalogue and the IAM’s catalogue. We are currently in negotiations with other libraries who wish to use Diamond-ILS, and in particular to catalogue their Arabic manuscripts. Diamond-ILS is the only software that allows both printed works and manuscripts to be catalogued according to the IFLA LRM model. Thank you all for your support in serving the classical Arab heritage and the dialogue of religions! On October 7th, Emmanuel Pisani, OP led a conference/debate in Paris proposed by Public Encouragement on the subject “The Question of the Separation between the Temporal and the Spiritual in the Muslim tradition: Challenges for French Secularism”. On October 10th, Guillaume de Vaulx gave a lecture entitled “The Dawn of the Muslim State”, as part of the annual lecture series “Sorbonne Talking” at Sorbonne University Abu Dhabi. On October 17th, Jean Druel, OP gave a lecture at the European Delegation on the role of al-Azhar in interfaith dialogue in Egypt. From October 17th to 19th, Emmanuel Pisani, OP participated in the XXIst Annual Meeting of the European People’s Party’s (EPP) Intercultural Group Dialogue with Churches and Religious Institutions in Lisbon, and participated in the panel “Education, Family, Churches, and Europe”. On October 25th, Guillaume de Vaulx gave a lecture entitled “What Arab Fables Say About Friendship Between Natural Enemies” at the French Institute in Beirut. On October 16th, René-Vincent du Grandlaunay participated in a workshop on Digital Humanities organized by the American University in Cairo. In particular, he presented the AlKindi online portal. On October 15th, Guillaume de Vaulx taught two classes, the first one entitled “Introduction to Islamic Philosophy: The Theoretical Question of Truth”, the second one entitled “The Political Question of Religious Obedience”, at the Beirut Higher School of Business. On October 22nd and 24th, Adrien Candiard, OP taught an eight hour class on the “divine attributes” at Saint Joseph University in Beirut, for the Master’s program in Interreligious Studies. While there, the play Pierre et Mohamed, of which fr. Adrien is the author, was performed in several schools. On September 1st, Emmanuel Pisani, OP was appointed member of the Council for Interreligious Relations and New Religious Movements of the French Bishops’ Conference, led by Bishop Jean-Marc Aveline. On October 12th, Emmanuel Pisani, OP and Amir Jajé, OP participated in a meeting of researchers and students from the University of Religions and Denominations (Qom, Iran), in partnership with the ISTR research lab “Islam and Otherness” and the CéSor (EHESS). On October 14th, we welcomed for lunch Mr. Nadim Ammann, who is in charge of Middle Eastern cooperation for the diocese of Cologne (Germany). On October 24th, several brothers of the IDEO were invited for lunch at the French residence to meet Mr. Charles Personnaz, who is conducting a project to preserve the Yezidi, Jewish, and Christian heritage in the Middle East. In October, we had the pleasure of receiving at the Scholars’ House Ms. Gyöngyi Oroszi, PhD student at the Avicenna Institute in Piliscsaba in Hungary, Mr. Jonathan Stutz, Professor of Church History at the Faculty of Protestant Theology, Ludwig-Maximilian University, Munich, and Mr. Nicolas Michel, professor of contemporary history at the University of Aix-en-Provence. The talk on the principles of interreligious dialogue, given by Bishop Jean-Marc Aveline at the second gala of IDEO (see the picture above), was inaugural in several ways. Not only did it inaugurate our academic year and our annual cycle of seminars (click here to register), but it was also a great exercise in communicating perceptive theological thought in simple words accessible to all: Catholics or non-Catholics, believers or non-believers alike (click here to listen to the conference). May this new academic year offer us many opportunities to exchange ideas with depth and finesse on what are sometimes complicated and sensitive subjects. On September 21st, Jean Druel, OP, along with Mr. Ilyass Amharar, gave a lecture entitled “’A Little Monday’: Ancient Rebuttals and Defenses of the Teaching of Sībawayh”, as part of the fifth meeting of the “Foundations of Arabic Linguistics” group at Cambridge University. From September 28-30th, Guillaume de Vaulx participated in the workshop “Art and Research” at the High School of Art in Aix-en-Provence, by setting up of a board game inspired by the fable of the animals in the Rasāʾil Iḫwān al-Ṣafā. On September 26th, Jean Druel, OP participated in the “Shared Heritage” conference in New York, which inaugurated the cooperation between the National Library of France and the New York Public Library. He participated in a round table discussion on the topic of “Research and Dissemination” as part of our collaboration with the Web Portal “Libraries of the Orient”. On September 11th, the Norwegian organization Stefanus Alliance International awarded Amir Jajé, OP and Mr. Saad Saloum, founders of the Iraqi Council for Interreligious Dialogue, the Stefanus Prize 2018. This prize is awarded every two years to people who work in the field of human rights, with a particular focus on freedom of conscience and religion. From September 26‒30th, the Dominican Roman Days were held in Rome, at the Pontifical University of St. Thomas Aquinas (the Angelicum). This is a gathering of about forty Dominican brothers and sisters who work in Muslim contexts. This meeting, which takes place every four years, is an opportunity to reflect together on the challenges of our activities and on the state of interreligious dialogue. Several members of IDEO participated: Rémi Chéno, OP, Jean Druel, OP, Robini Marianto, OP, Claudio Monge, OP and Jean Jacques Pérennès, OP. Jean Druel, OP gave a lecture on the linguistic problems of the intelligibility of the faith, and Jean Jacques Pérennès, OP gave a lecture entitled “Dialogue and Otherness: Pierre Claverie’s Contribution to the Reflection on Interreligious Dialogue”. On September 6th, we welcomed for lunch Mrs. Marie-Hélène Avril, Lecturer at the University of Bordeaux. On September 13th, we welcomed for lunch Mr. David Ruffel, in charge of the Book Service at the French Institute of Egypt. On September 17th, we welcomed for lunch Mrs. Marie-Delphine Martellière and Mr. Paul-André Claudel from the Center for Alexandrian Studies (CEAlex). On September 17th, we received Mr. Djim Dramé, Director of the Laboratory of Islamology of the Fundamental Institute of Black Africa (IFAN) in Dakar, and Mr. Ousmane Diaw, Editor in Cairo, to explore the possibility of collaboration on cataloguing the manuscripts of IFAN. On September 29th, we welcomed for lunch Mr. Julien Loiseau, Professor of Islamic history at the University of Aix-en-Provence. I hope you had a good summer, fruitful yet relaxing at the same time. We often receive messages from friends lamenting the fact that this Newsletter reports past events more than it does future events. The idea behind the newsletter is to openly share what is really happening at the IDEO, rather than to use it as a forum to advertise. To keep informed about our upcoming activities, you can subscribe to this newsletter and check the “Seminars” box, you can follow us on Facebook and Twitter, and you can view the calendar on our site. 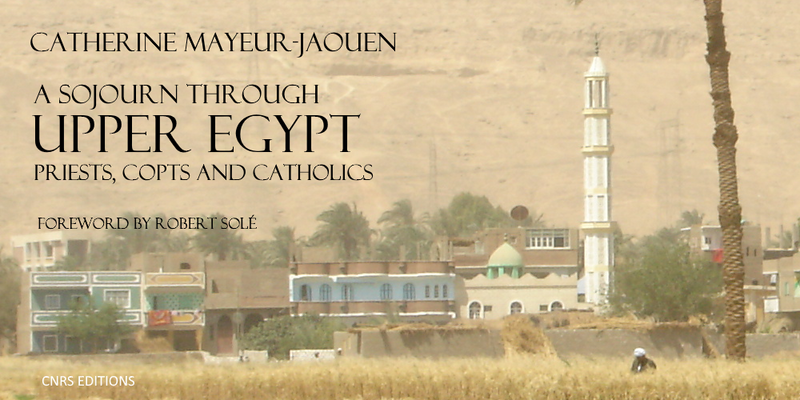 This is going to be a year of collaboration with several Egyptian and international institutions: the Francophone sections of al-Azhar University, the Institute of Arabic Manuscripts of the Arab League in Cairo, the Tafsir Center in Riyadh, the Hindawi Foundation, the Egyptian Association for Historical Studies, the Department of Arabic and Islamic Civilization at the American University in Cairo (where three of our brothers are graduate students), and the Vatican Library, where Adrien de Fouchier, OP works. These collaborations reflect our commitment to participate in the efforts of Arabic-speaking Muslim scholars to break out of their isolation from international research and to study the classical texts in the light of contemporary human sciences. A portion of these activities is funded by the European Delegation in Cairo, as part of the new project “Adawāt: Tools for Critical Thinking in Islamic Studies”. All this is also possible due to your help and support! On behalf of the members of the IDEO, our collaborators, and our partners, a big thanks to you all. On July 4th, we were invited to a dinner at the French Embassy to meet delegation from the French parliament who are working on the situation of the Christians in the East. From July 17‒19th, a training on cataloguing functionalities developed by Diamond-ILS for AlKindi was given to a team of four people from the Tafsir Center (Riyadh). From July 20‒24th, Mr. Mohamed Malchouch, future director of the IDEO cataloguing department, came to visit the library. Currently in charge of the Division of Document Processing at the King Abdul Aziz al-Saoud Foundation, Mr. Mohamed Malchouch should be assuming his new duties in the IDEO library at the beginning of October. On July 24th, Jean Jacques Pérennès, OP gave a lecture at Saint-Brieuc titled, “Jerusalem: What are Paths Towards Peace?”. He gave the same lecture on July 31st in Trébeurden, on August 2nd in Tréguier, and again on August 6th in Rhuys. we are glad to announce the publication of volume 33 of MIDEO, dedicated to the Islamic theology of religious diversity. Just as Christianity, Islam must articulate its claim to universality with the reality of a multitude of other religions. What is their status? Are they willed by God? Are they outdated? Are they part of Islam itself? Muslim scholars have been exploring these questions since the early centuries of Islam, and this is the topic of this volume of MIDEO. 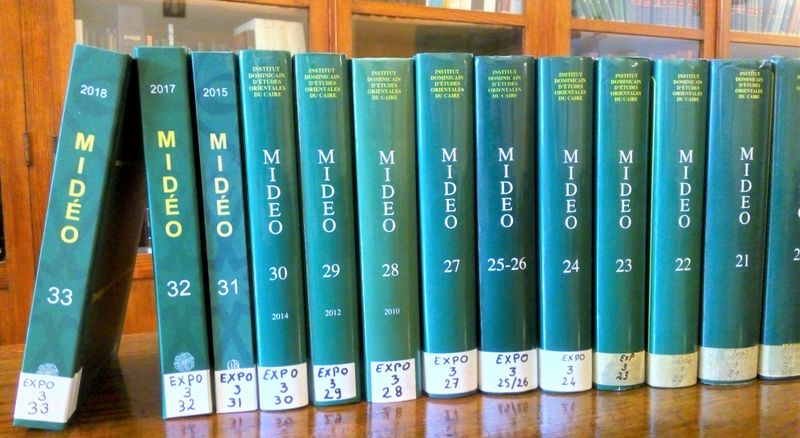 Starting volume 31 (2015), and thanks to the work of IFAO, MIDEO is fully available online on the OpenEdition website, so you can read this volume 33 by clicking here. In addition, we are pleased to announce that we have made available online the articles of the previous volumes, from 1 (1954) to 30 (2014). In total, more than 220 scientific articles are accessible via the AlKindi catalogue. We hope you enjoy reading them! On June 7th, Guillaume de Vaulx gave a conference at the Orient Institut of Beirut entitled “Friendship between natural enemies: the ambitious brotherhood of Ikhwān al-Ṣafā”. From June 19‒22nd, René-Vincent du Grandlaunay, OP participated in the annual conference of the Middle East Library Committee, MELCom International, which was held this year at the Library of the Hungarian Academy of Sciences in Budapest. On June 10th, Dennis Halft, OP gave a lecture entitled “Muḥammad Reżā Jadīd al-Islām (d. 1266/1849) and his anti-Jewish polemical work” at the international workshop “The Jews of Iran: Society, culture and politics through the ages” organized at Tel Aviv University, Israel. On June 18th and 19th, Amir Jajé, OP participated in the international conference “Human rights and conditions for inclusive citizenship in conflict zones” organized in Oslo by HL-senteret Center on the occasion of the 70th anniversary of the Universal Declaration of Human Rights. From June 26‒28th, Emmanuel Pisani, OP participated in the second international congress of PLURIEL “Islam and belongings” during which he gave a lecture entitled “Al-walāʾ wa-l-barāʾ: issues of a Salafist principle on the perception and the status of the other”, at the Gregorian University in Rome. On June 25th, René-Vincent du Grandlaunay, OP and Jean Druel, OP were interviewed by the Saudi channel Al-Arabiya as part of a television documentary on the IDEO library. On June 28th, Jean Druel, OP was interviewed on the work of the IDEO by Mr. Amr Mabrouk on Radio Cairo. On June 16th, we welcomed for lunch Mr. Amar Ouali, from the military mission of the French Embassy in Cairo. On June 18th, we welcomed for lunch Mrs. Nora Kalbarczyk, Head of the Middle East Zone for KAAD, the German Catholic University Exchange Service, which offers scholarships to students from the Middle East in Germany. She was accompanied by Fr. Kamil William and Mr. Michel Ghattas, her correspondents in Egypt. On June 20th, we welcomed for lunch professor Mohamed Serag, Director of the Department of Arabic Studies at the American University in Cairo, and Mrs. Wafya Hamouda, his assistant. On June 22nd, we welcomed for lunch Mr. Simon Schäfer, a trainee from the Political Department of the Swiss Embassy in Cairo. The academic year has ended like last year, with a seminar session (photo) and an ifṭār to which a hundred people attended. It was an opportunity to welcome new students and researchers at the IDEO. At a time when more and more researchers work alone and only document on the Internet, it is important to recall the importance of human exchanges and libraries, because not everything is on the Internet and nothing can replace the encounter with other human beings. On May 11th, Emmanuel Pisani, OP gave a lecture called “Al-Ghazali and His Approach to Diversity” at the Interreligious Documentation Center of the Dominicans of Istanbul. 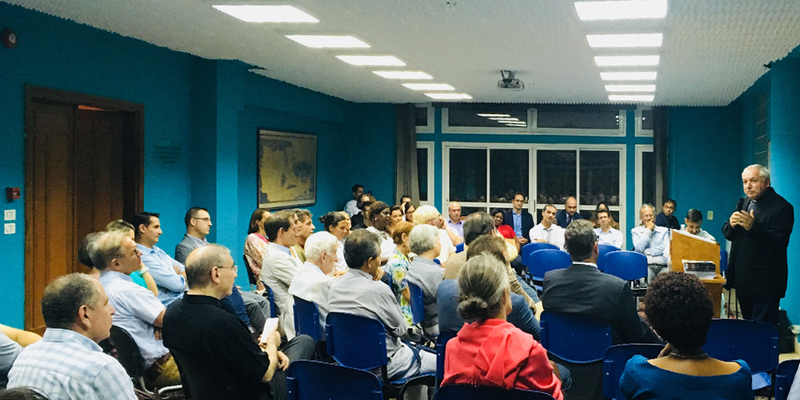 On May 14th, Mateus Domingues Da Silva, OP gave two presentations entitled “Islam as an Act of Faith” and “The Relationship between kalām and falsafa in Classical and Post-Classical Islam”, as part of a meeting organized by the Rio de Janeiro regional section of the National Conference of Brazilian Bishops and by the Commission on Faith and Reason of the Archdiocese of Rio de Janeiro. On May 15th, Jean Druel, OP gave a lecture entitled “The Challenges of Studying Arabic” to students of DEAC (Department of Contemporary Arabic Education) in Cairo. On May 24th, Emmanuel Pisani, OP led a conference-debate on the topic “The Question of Heterodoxy in Islam” in front of about fifty prisoners at a penitentiary center in Bois d’Arcy in France. On May 26th, Emmanuel Pisani, OP gave a lecture entitled “Untie for Dialogue, Connect for dialogue: The Mystery of Communion in Christianity” at EFY (French Yoga School) as part of the conference “Untie, Connect”. On May 29th, Jean Jacques Pérennès, OP gave a lecture entitled “Padar Serge de Beaurecueil, a Dominican Scholar in Afghanistan”, as part of the conference “Afghanistan: society, freedom and proclamation of the Gospel” organized by CIAM (International Center for Mission and Formation) in Rome. On May 10th, the second meeting of the collaborative group between Jesuit, IFAO and IDEO’s librarians was held at IFAO. On May 17th, René-Vincent du Grandlaunay, OP participated in a working day at the Forney Library in Paris. This day was devoted to RDA cataloguing of artifacts. On May 21‒22nd, René-Vincent du Grandlaunay, OP participated in two working meetings with the Vatican Apostolic Library team in order to study possible collaborations in the field of Arabic manuscripts. On May 3rd, Emmanuel Pisani, OP led a study day entitled “The Question of Salvation in Christianity and Islam”, as part of the formation days for hospital chaplains in Lyon. From April 24th to May 4th, we received Rajen Lakra, OP who was sent on an exploratory mission to the IDEO to think about the foundation of a Dominican center for interreligious dialogue in India. On May 1st, we welcomed for lunch Mr. Mikaïl Chebel, PhD student at EHESS, and Miss. Miléna Planche, from the Seasonal Poles of the French Institute. From May 8 to 14th, we received a visit from Emilio Platti, OP. On May 11th, we welcomed for lunch Mr. Albin Andrieux, Professor at the IDAI (Institute of International Business Law) in Cairo. On May 27th, we welcomed for lunch Mrs. Isolde Lehnert (Librarian of the German Institute of Archaeology), Mrs. Jane Smythe (Egyptologist at the Egyptian Ministry of Antiquities) and Heike Schmidt (journalist). On May 28th, we welcomed for lunch Mr. Damien Fréjaville (responsible for IFAO’s heritage and security), Mr. et Mrs. Villalbi (Programmers), Mrs. Agnès Macquin (librarian of IFAO), and Mrs. Nermine Nabil (librarian of IFAO) as part of a reflection on the extension work of the IFAO library. In May, we had the pleasure of receiving at the Scholars’ House Mr. Walid Saleh, Professor at the University of Toronto, Mr. András Mércz and Miss. Gyöngyi Oroszi PhD students at the Avicenna Institute in Piliscsaba, Hungary. The conference on the interactions between Shiites and Christians organized in Paris was a great moment in the life of the Institute. Even if the lectures were highly technical, they captured everyone’s interest by overlapping and allowing exciting and accessible discussions for all present. This is exactly the aim of research: to go down into specifics that may seem too detailed, then to touch the universal and link the questions of our contemporaries to the subjects of the day, yet with a historical and critical depth that is not possible with a generalist approach. Thanks to all the speakers and to you all for your participation and support! On April 5th, Jean Druel, OP gave a lecture on AlKindi, IDEO’s cataloguing system, to researchers at the Academic Journals Observatory, which depends directly on the Sheikh of al-Azhar. On April 6th, Emmanuel Pisani, OP, with Mr. Christian Lochon and Bishop Pascal Gollnisch, participated in the Diocesan Day of Formation for Catholic Teaching in Toulon where he gave two lectures entitled: “Dialogue and Proclamation in the Thought of Benedict XVI” and “Diversity in Islam”. On April 9th and 10th, Emilio Platti, OP and Adrien Candiard, OP participated in the interreligious theological working group of SNRM (National Service of the Bishops of France for Relations with Muslims). On April 15th, Emmanuel Pisani, OP led a morning of studies on interreligious dialogue at the diocesan center in Bondy, as part of the formation days of the Diocese of Saint-Denis. On April 23th, Rémi Chéno, OP moderated one of the sessions of the day organized by Ms. Naïma Bouras and the CEDEJ at the French Institute of Egypt in Cairo, entitled: “Feminine Religious Dynamics in Egypt: What Forms of Engagement?”. On April 25th, Guillaume de Vaulx organized a seminar at the French Institute of the Near East in Beirut entitled “The Mirrors of Medieval Princes: Between the Art of Governing and the Art of Submission”. He also gave a lecture at the seminar, entitled “Abbasid Fables: From Being Mirrors of Princes to being Mirrors of the People”. From April 26‒28th, Amir Jajé, OP gave a lecture entitled “Migration (Emigration and Immigration) and Conversion as a Challenge of Theological Teaching: the Situation in the Near East”, at a conference on theological teaching in the Near East at Holy Spirit University of Kaslik in Lebanon. On April 3rd, the Faculty of Arts of Cairo University awarded to Giuseppe Scattolin, MCCJ the emblem of the Faculty in recognition of his contribution to the renewal of Sufi studies through his numerous scientific works. On April 14th, Amir Jajé, OP organized a Muslim-Christian meeting around the Virgin Mary at the Dominican Priory of the Annunciation in Paris. This meeting was an opportunity for Christians and Muslims of different persuasions to pray together. From April 15‒20th, Emmanuel Pisani, OP accompanied the ISTR study trip from Paris to Rabat and Casablanca. From March 29th to April 9th, we received the visit of Adrien de Fouchier, OP who is works at the Vatican Library, and is writing a catalogue of Christian Arabic manuscripts. On April 2nd, we welcomed Mr. Georges Fahmi, researcher at the European Academic Institute in Florence, who works on the rapprochement between al-Azhar and the Vatican in recent years. On April 16th, we welcomed for lunch Mrs. Éléonor Fallot, coordinator of the CCFD (Catholic Committee for Hunger and Development) for the region. On April 16th, we also welcomed for lunch Mrs. Sylvie Nony, researcher in the history of Arabic sciences, who is currently working on the persistence of the idea that some people really believed that the earth was flat. From April 18‒25th, we received Mr. Dominique Avon, researcher in History, who is currently working on the history of the freedom of conscience in Islam. On April 25th, we welcomed for lunch Mr. Michael Driessen, Professor of Political Sciences at John Cabot University in Rome, who works on the geopolitics of interreligious dialogue. In April, we had the pleasure of receiving at the Scholars’ House Ms. Noëmie Lucas, PhD candidate at Paris Panthéon-Sorbonne University, Mr. Olivier Rampnoux, professor at the University of Poitiers, and Mr. Sami Benkherfallah, PhD student in history and archaeology at the University of Poitiers.